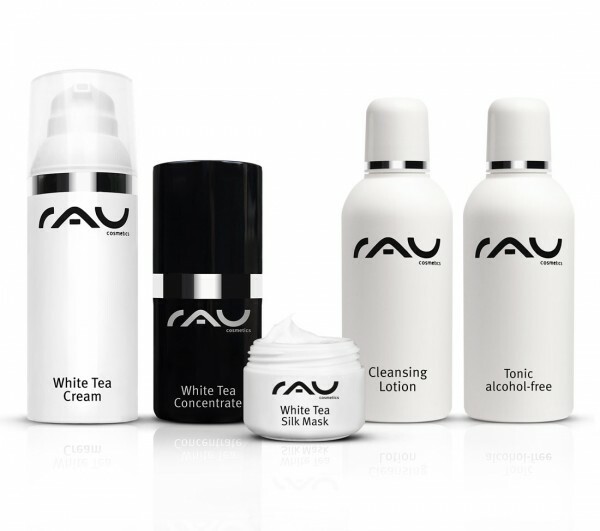 Apply a generous amount of "RAU Cleansing Lotion" on your face and massage it in gently for ca. one minute. Afterwards, rinse it off thoroughly and dry your face. Apply some of our toner "RAU Tonic alcohol-free" on a cotton pad, cleanse your face and wait a few moments until it has been absorbed by skin. Finally, spread one to two portions1-2 "RAU Calming & Repair Cream" on your face and gently massage it in. Use "RAU Calming & Repair Mask" one or two times a week (preferrably in the evening) and treat your skin to a very special beauty product. Wash your face and cleanse it with toner like usually. Then, aplly a sufficient amount of this mask until your skin shimmers through only lightly. Let it stay on for approx. 10 minutes, you can massage in any residue. As "RAU Calming & Repair Mask" can remain on your skin, you don´t have to apply further skincare products. We recommend using our "RAU Enzympeeling" approx. every two weeks. Wash and cleanse your face with toner like usually. Then, apply a generous amount of the peeling on your face, avoiding the eyes. Depending on your skin condition, let it stay on for 10 to 20 minutes. Afterwards, rinse it off thoroughly and cleanse your skin with "RAU Tonic alcohol-free" one more time. Now, you can continue your beauty routine with our "RAU Beta Glucan Recovery Mask" as your skin is deeply cleansed and in a perfect state to absorb any subsequent nourishing ingredients. Alternatively, you can finish at this point by applying our "RAU Sensitive 24h Cream". Related links to "RAU Cosmetics Starter Set Dry Skin"
Customer evaluation for "RAU Cosmetics Starter Set Dry Skin"